Many businesses use palletization optimizing softwares to automate calculations of how to best maximize their pallet loading efficiency. 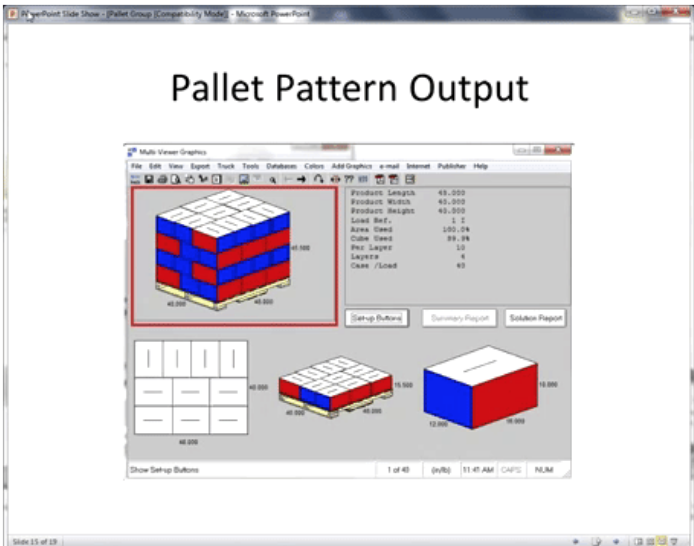 Let’s look at two very popular palletization software programs and what they offer. Cape Pack is a packaging software that allows you to do a complete manufacturing walkthrough- all the way from primary product packaging to shipping. With Cape Pack, there are a few options for tackling a packaging challenge. You can go from product to package, package to shipping container, or product to shipping container. If you choose to go from product to shipping container you can select the shape of your product. For example, if you have a square bottle you can select that, enter your length, width, height and weight. This will then suggest a primary package that will be formed around your product. Next, the secondary package dimensions are determined and Cape Pack picks out different formations that fit your primary package and give you percentages on area used in the secondary package. Following this you can choose a pallet size, height of the pallet stack, view overhang options, and determine how much weight you would like on the pallet. Once your requirements are noted, the software runs through many different stacking patterns that can be created from your parameters and calculates the different surface area/volume percentages used. After this is calculated, you can determine what kind of shipping container you would prefer, which is almost always a 53 foot container. The software then shows the most efficient ways to load the pallets into the container. TOPS PRO is another packaging design software, similar to Cape Pack. With this software you can determine the package size, arrangement, pallet configuration, stacking strength recommendations and truck placement. Product Sizing - Enter the dimensions of your product for any shape to see a 3D rendering. Ship Case or Carton Design - Users can create their own custom tray using the TOPS’ CASY (Create a Shape Yourself) option. Pallet Configuration - TOPS PRO automatically generates different pallet patterns to help with shipping costs and optimal structure. Container or Truck Optimization - This shows the most optimized way to palletize homogeneous products and handles floor spacing options to help minimize cost. 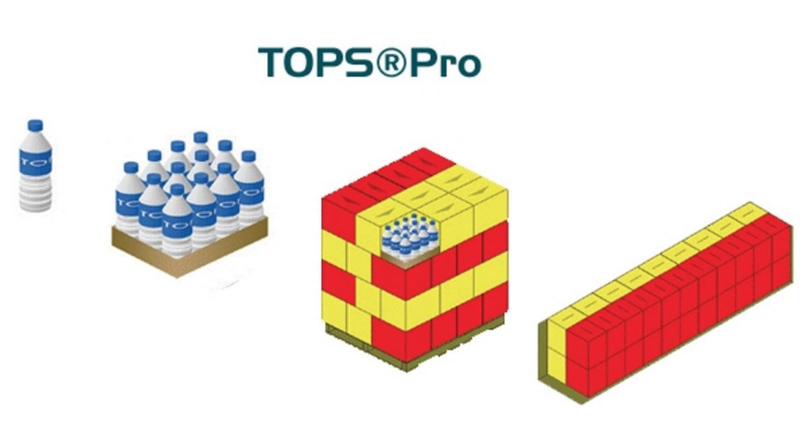 TOPS Pro will also show mixed pallets for club stores, as well as a stacking analysis. The analysis shows calculations for the load results on boxes and box types based off the inputs from the user in the first step. Pallet optimization is an important step in the packaging lifecycle. Don’t struggle through it on your own. A palletization program can make your life easier and your shipping more efficient, as well as save you time and money. The right software can bring you confidence by sorting through the options and selecting the most optimized solution based on your shipping container, pallet, and carrier requirements.